This play was written by Conor McPherson over twenty years ago and was first performed in the Bush Theatre in London in 1997 with Brian Cox starring. It was revived by the Donmar Warehouse Theatre and was performed in London in a tiny 50 seat theatre with the much sought after tickets being assigned by lottery. It has now transferred to the larger venue of the main space in Smock Alley as part of the Dublin Theatre Festival. It is performed by Brendan Coyle who is known to many for his role as Mr Bates, the valet, in Downton Abbey. He also starred in Paths to Freedom and will shortly be seen as the Earl of Lennox in the Mary Queen of Scots biopic which stars Saoirse Ronan in the title role. He has a long association with McPherson and won the Olivier Award for Best Performance in a Supporting Role for The Weir in 1999. The play is a monologue about a theatre critic who has grown tired with his life. He is bored with his job and sees little of value in what he does, ending most of his evenings in the various pubs and clubs around Dublin. That is when he sees a version of Salomé and becomes smitten with a young actress who performs in it. The play takes place in the front room of the critic’s house. His windows are covered over with newspaper and there is a run down feel to the room, with buckets located to catch the intermittent drops from the ceiling. Another nice touch is that there are a small number of seats on the stage, which allows the audience to be thoroughly immersed in the story. Coyle walks around the stage looking directly into the audience member’s eyes and touching some of them on the shoulder as he passes. It creates an intimacy almost as if we are being welcomed into his world. The early part of the story is focussed on the role of the critic and in particular on his damaged soul. The critic saw himself as destined for greater things and still writes poetry, but most of it ends up in the bin! As with much of McPherson’s work, there is a supernatural element to the story. The second part of the play is devoted almost entirely to a story involving vampires. While this is an interesting plot line, the early parts of the play where he spends his time drinking in Dublin are what really resonate. 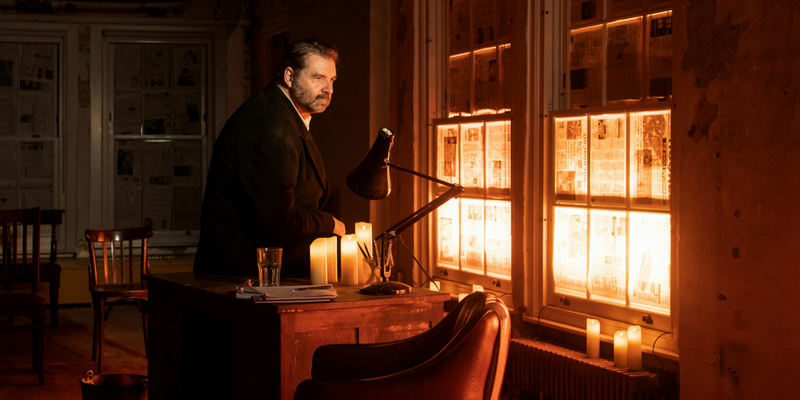 While it is well written, the performance by Brendan Coyle is what really grabs you about this production. He captures the necessary swagger and charisma of this complex character. If he was just a bitter critic, it would be difficult to relate to him, but he has a magnetism that makes him impossible to ignore. This production is definitely one of the highlights of the festival and is not to be missed.